To educate and prepare individuals to be competent, Compassionate and Ethical Allied Health Professionals from Demographically diverse backgrounds to meet the future health care needs of the community. The B.Sc. courses are affiliated to the Tamil Nadu Dr. M.G.R University. The course duration is 3 years and 1 year internship. Both Female & Male Candidates will be selected for the course. Students should attend theory and practical classes. Annual theory and practical examinations will be conducted at the end of each year by the Tamil Nadu Dr. M. G. R. Medical University. Students should have a minimum of 85% attendance in the theory and 100% in the practical to be eligible to appear for the annual examination. After successful completion of the course a Bachelor of Science degree is awarded by the Tamil Nadu Dr.M.G.R. Medical University. Candidate should pass in +2 with English, Physics, Chemistry, Biology, or Botany and Zoology (Science & Maths Group) with minimum 35 % Marks in each subject separately including English. A Candidate should have completed the age of 17 years at the time of admission or would complete the said age on or before 31st December of the year of admission to the course. The candidate who has passed any qualifying examinations other then the Higher Secondary Course Examination conducted by the Government of Tamil Nadu, before seeking admission should produce an Eligibility Certificate from the Tamil Nadu Dr. MGR Medical University, Chennai. Selection is based on merit. There will be written tests in English, general knowledge, Science. There will also be a personal interview to assess aptitude, personality and proficiency in English. If the candidate is selected, he/she has to undergo a medical examination and if fit can join the course. Application form and Prospectus can be obtained from the The Administrator/ Principal, Dr. Jeyasekharan Medical Trust, College of Allied Health Sciences, K.P.Road, Nagercoil – 629003, and apply in prescribed form. A copy of the Prospectus and Application will be sent to the candidate on request made to the Principal together with a payment of Rs.500/- by Cash/Bank Demand Draft drawn in favor of the “Dr.Jeyasekharan Medical Trust, School of Nursing” , payable at Nagercoil. This amount is NOT refundable. If you have downloaded the application form from the website, please send filled form with the above mentioned payment to Office/ Principal, Dr. Jeyasekharan Medical Trust, College of Allied Health Sciences, K.P.Road, Nagercoil 629003. Application will only be processed after this application fee is paid. The application should be filled in by the applicant in his/her own handwriting legibly and in block letters. The candidate should write his/her full name as in the S.S.L.C. Certificate. Completed application forms along with relevant enclosures (Attested Photo copies of H.Sc / +2 / Equivalent Mark sheet, 10th Mark Sheet, Transfer Certificate , Migration Certificate ( other than H.Sc of Tamil Nadu), No objection certificate ( for Foreign Candidates), Community Certificate, Conduct Certificate, 6 copies of recent colour passport size photograph along with the Demand Draft should be sent to the Principal, Dr. Jeyasekharan Medical Trust, College of Allied health Sciences, K.P. Road, Nagercoil -629003. Those finally selected for admission after interview and test will be required to register for the course by paying the tuition fee and admission formalities. Students should submit their original certificates. Candidates who have passed any qualifying examination equivalent to the higher secondary examination conducted by the Government of Tamil Nadu should produce an eligibility certificate from the Tamil Nadu Dr. M. G. R. Medical University before seeking admission. The School & College is opened from 9.00 Am to 5.00 PM on week days and from 9.00 AM to 1.00 Pm on Saturdays. All business with the College, Hostel may be attended during office hours. Please note that the office remains closed on certain public holidays. You may meet the Course Director between 3.00 pm to 5.00 pm from Monday to Friday. If you require meeting the Course Director at any other time, you are requested to make on appointment before coming. This may be done via telephone. Classes are conducted by highly experienced Physicians, Surgeons and technical people of respective departments. We have a full time and part time faculty. The faculty takes responsibility in motivating the students in their education & training. The students are provided with Latest equipment’s which includes computers internet connection for learning, slides, overhead projectors LCD Projector & equipment’s such as laser printers, scanners & CD writers together with a wide range of audio visual and multimedia facilities. 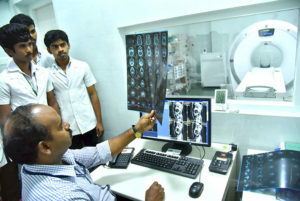 The laboratories for Anatomy, Nutrition, Fundamentals of Nursing, Microbiology, Biochemistry, Audio-Visual Aids and Computers offer best learning facilities to develop the technical skills before the students have practice on patients. Library is a treasure-house of knowledge. A well-stocked library is there in our institution with latest edition of nursing & paramedical text books, journals, magazines and newsletter including internet connection to cater to the needs of our students & staff to help them keep abreast with the fast paced world. The clinical experience for students is offered at Dr. Jeyasekharan Hospital and Nursing Home. 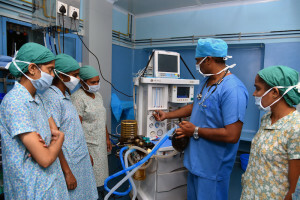 It is a 200 bedded multi-speciality Hospital. Students are also posted in other affiliated Hospitals for their additional clinical experience.